Add all the ingredients into a blender, and blend until smooth throughout. Everyone who knows me knows how obsessed I am with the mint-chocolate chip combination. I have a hunch that because my mom ate a lot of mint-chocolate chip ice cream whilst pregnant with me, I developed a deep love for it. It also might be why I developed a dairy intolerance at a young age, but who knows! 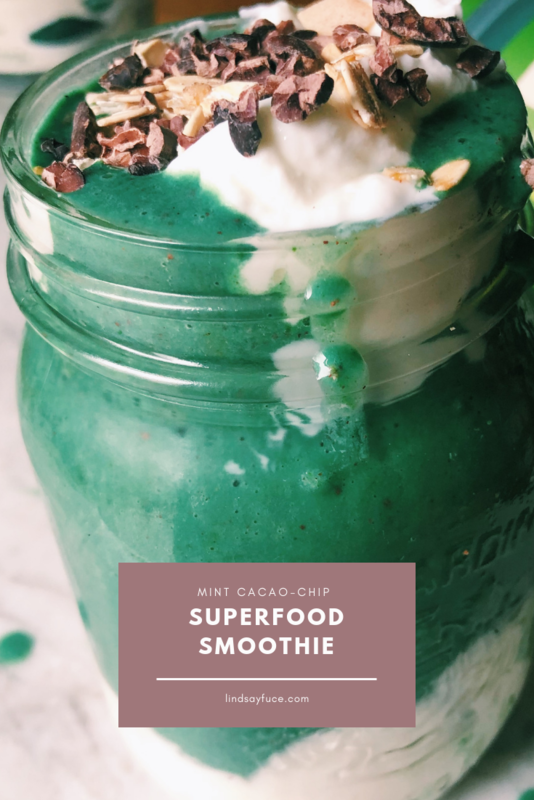 This Mint Cacao Chip Superfood Smoothie recipe is perfect for springtime but also is a good refreshing treat for summer. It includes a few superfoods, like spirulina that are so good for your body. Over the past couple of years, I’ve worked to incorporate nutrient-dense superfoods like spirulina instead of relying on vitamins or supplements. Compounds like spirulina have been really effective in helping my immune system, and getting it to a place of health. If you struggle with autoimmune problems, or just immunity problems in general, I’d advice that you add some spirulina to your smoothies, or recipes in order to get in some of its great benefits. It is a complete source of high-quality protein and has the same amount of protein in 1 gram as a whole egg. Spirulina is a rich source of iron, vitamin B1, iron, calcium, and contains other essential nutrients like magnesium as well. Spirulina is made from 65% protein and amino acids, which includes the essential fatty acid gamma linolenic acid (GLA). This fatty acid aid your inflammatory system, and is not common to find in foods. Not only does spirulina contain GLA’s, but it is full of Omega 3-,6 and 9s and has high levels of Omega-3s. Antioxidants play an important role in protecting the cells in our body from getting damaged. While berries get a notorious rep for being antioxidant dense, spirulina contains phycocyanin, which is a potent anti-inflammatory. I’ve taken spirulina as a superfood supplement for years. It’s helped me get back my health, as well as stay as a constant anti-inflammatory. It’s easy to toss in a smoothie, or even make some bars with. I have been experimenting with a peanut butter cup-like creation, so maybe I will share that soon too! I get my spirulina, along with a few of my other superfood supplements, like chlorella, from BareOrganics. Not only are their supplements great, but they use 100% recyclable, BPA-free and reusable containers. P.S. If you like this super green spirulina smoothie bowl, make sure to check out my adaptogen packed smoothie! You can find my adaptogenic peanut butter smoothie here! **This post is brought to you by Bare Organics. Even though it is sponsored by Bare Organics Superfood, all content, opinions, and words are my own. I just want to say a quick thank you for supporting the brands that allow me to create and share these fun and creative recipes with you!